This specification covers the requirements for two types of single wall, electrical insulating, extruded tubing whose diameters will reduce to a predetermined size upon application of heat in excess of 175° C (347° F) for MT1000 and 140° C (284° F) for MT2000. The tubing shall be homogenous and essentially free from flaws, defects, pinholes, seams, cracks or inclusions. The tubing is fabricated from materials, which meet the requirements of U.S. Pharmacopeia Class VI Plastics. Color shall be translucent or black unless otherwise specified. 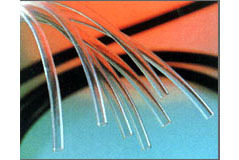 MT1000 is semi-rigid polyvinylidene material. MT2000 is medical grade polyolefin material.